First, we will administer dental anesthesia and may also recommend dental sedation. These treatments help ensure a comfortable experience and allow patients to enter a calm state, with little to no memory of the procedure. If necessary, we then open the area and gently remove the tooth, or rock it back and forth from the socket. If necessary, we suture the area afterward. When you return home, we will provide detailed instructions for brushing, flossing, eating and drinking to help avoid complications in the hours and days following the extraction. We also schedule follow-up appointments to monitor your progress. When do we prescribe treatment? Well, we often urge patients to undergo an extraction if they have wisdom teeth on the verge of eruption. 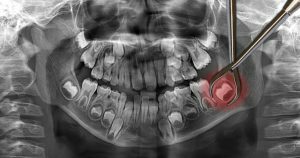 The arrival of these four additional molars could lead to misalignment, or infection and pain due to partial eruption, known as impaction. To prevent issues with your smile’s appearance and health, we recommend addressing the problem as soon as possible. These teeth tend to erupt in our late teens or early 20s so if you or a family member falls in that age range, let us know. We also may remove a tooth to make room for alignment correction, improving your bite balance and dental alignment. If a tooth is severely injured, or develops an advanced infection, then again a patient may benefit from removal. We also offer extractions for teeth that become loose due to periodontal disease. With wisdom teeth, obviously replacing the tooth is not a concern. But what if you lose a tooth to injury, infection, or gum disease? Having a gap in your smile due to tooth loss could lead to complications. However, we can talk about options to address the gap and preserve your smile’s health and beauty. For example, we may suggest a dental bridge or dental implant for minor tooth loss, or also discuss the benefits of a full or partial denture. If you have any questions about our dental extractions, or about preventing wisdom tooth impaction, then contact our team today. Our team offers tooth removal to combat a number of oral health issues. Our practice is ready to help you with your dental extraction in Des Moines, IA and help patients enjoy healthier smiles. To schedule an appointment, call our office today at (515) 244-9565.